If you are Swedish or Scandinavian, chances are that your only US experiences are limited to New York or Los Angeles. Minnesota is a fantastic US destination, offering natural beauty and metropolitan culture, US heartland and an international harbor city, Swedish heritage sites and the Mall of America. Find out why 5 million Americans love to live here, and why Swedish ancestors settled primarily here in the Great Emigration. Welcome to join our Discover Minnesota tour in 2019. 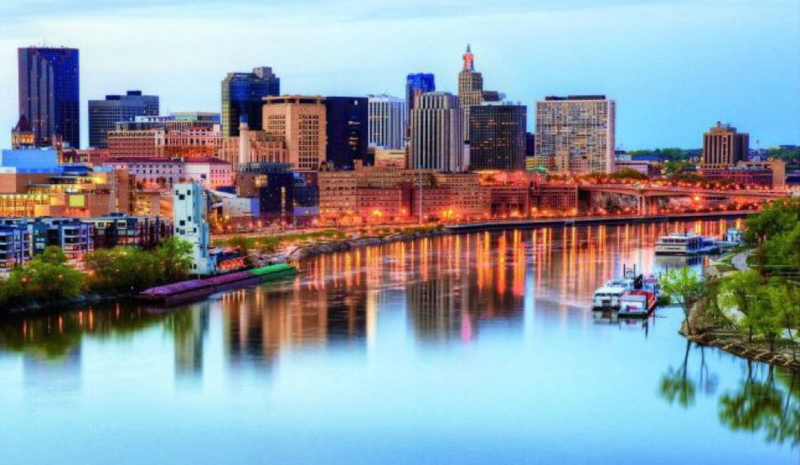 We will enjoy the Twin Cities of Minneapolis and St Paul, walk in the footsteps of Wilhelm Moberg and the Swedish emigrants in the settlements of Lindström, Chisago City, Stillwater and Taylors Falls, and tour the international harbor city of Duluth on Lake Superior. Many other delights await you on this 8-day tour. Read on to see some of the highlights! The American Swedish Institute in downtown Minneapolis is a must-see for any visitors with Swedish roots. Known as the Turnblad mansion, it was the home of newspaperman Swan Turnblad, Swedish emigrant and founder and publisher of Svenska Amerikanska Posten, the largest Swedish language newspaper at the turn of the century. The Turnblad family donated their mansion in 1929 to the American Swedish Institute, an institution to preserve Swedish art, literature and science among the Swedish immigrants to Minnesota. CNN stated in 2015: “A trip to Minneapolis isn´t complete without a visit to the American Swedish Institute”. 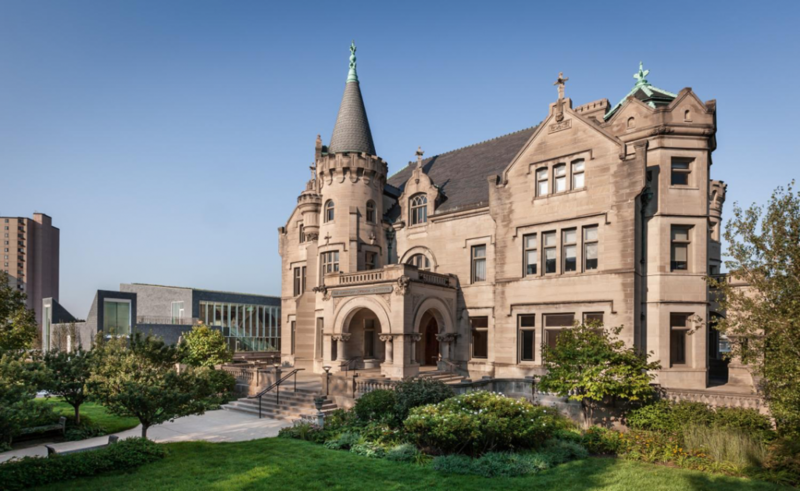 We will visit the America Swedish Institute to explore the enduring links to Sweden in the US and in Minnesota, both from a historical and modern-day perspective. A significant site of Native American and US history is located between the Mississippi and Minnesota Rivers east of St Paul. Archeologists have traced human activity in this spot going back 9,000-12,000 years ago. An important location in native American Ojibwe (Chippewa) and Dakota (Sioux) history, the US government established the St Peters Indian agency on this site in the 1820´s to settle disputes and control the fur trade with European explorer traders. 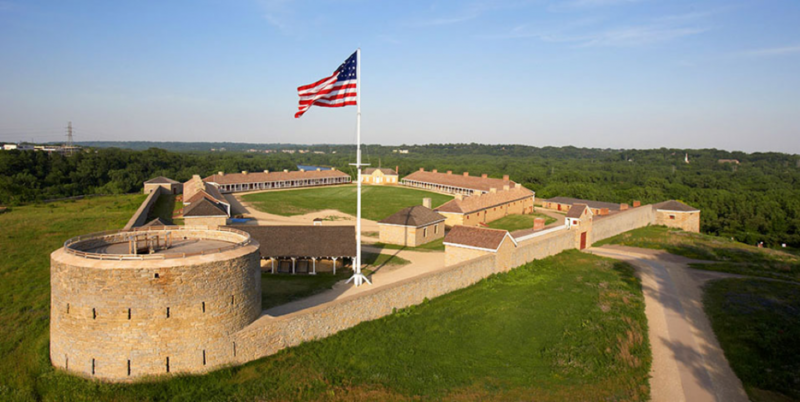 Fort Snelling remained a military outpost to the West for several decades up to the America Civil War. After 1865, it continued to expand for many decades that were characterized by the great Emigration from Europe to Minnesota. Fort Snelling served as a military training post during the Spanish-American and First World Wars. 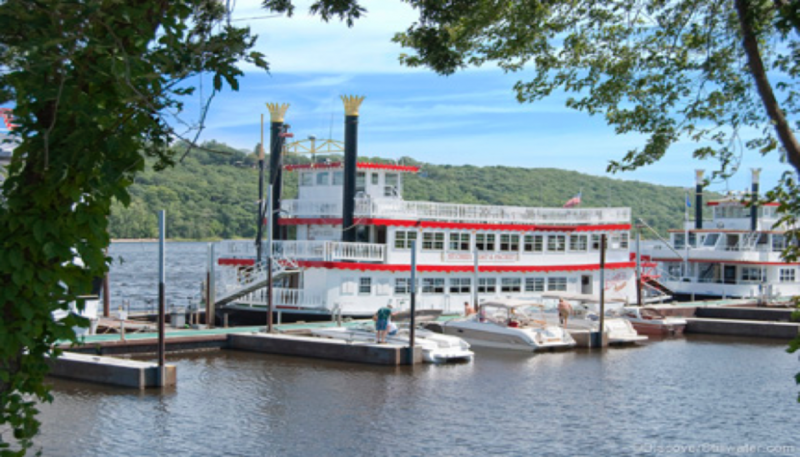 Stillwater is a beautiful and historic river town that sits just 30 minutes northeast of St Paul on the bluffs of the St. Croix River. Many immigrants made their first Minnesota landing in Stillwater, and by the 1880´s the town became the largest lumber producer in the world, with lumber barons to rival those in Sweden. We will visit historic Stillwater, enjoy a meal at the Dock Café, and enjoy free time for shopping. Nestled among a series of lakes and rivers about 45 miles north of the Twin Cities is the Chisago Lakes area, and the Swedish Heritage Cities of Chisago City, Lindström, Center City and Taylors Falls Minnesota. The first Swedish immigrants came to the Chisago Lakes area in the early 1850s. The area was thick with forests and lakes, very similar to Sweden. The Chippewa Indians called this land KichiSaga, meaning fair and lovely waters. Welcome to a full day tour in the footsteps of Vilhelm Moberg, who lived here and was inspired to write his epic trilogy The Immigrants here. Chisago City, named for the lake Ki-Chi-Saga, is the first Swedish immigrant heritage city we will visit. Moberg Park is home to the annual Ki-Chi-Saga Days festival, and features the statue of Vilhelm Moberg for which it was named. 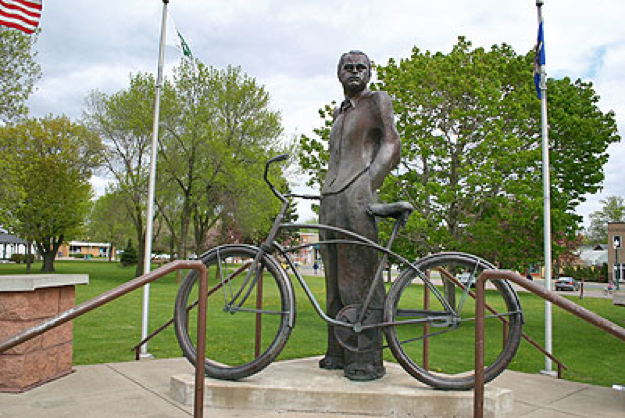 Moberg, did his historical research and traveled the Chisago area in 1948 on bicycle. The statue commemorates Moberg’s travels here and was visited by King Carl-Gustaf XVI and Queen Silvia of Sweden in 1996. Lindström Minnesota is a classic Swedish heritage city, also depicted in The Immigrants trilogy by Wilhelm Moberg. The statue of Moberg´s characters Karl-Oskar, looking forward to the future, and Kristina, looking back to Sweden is located in the center of town. Enjoy a stop here for a good cup of coffee and delicious baked goods, and some shopping. 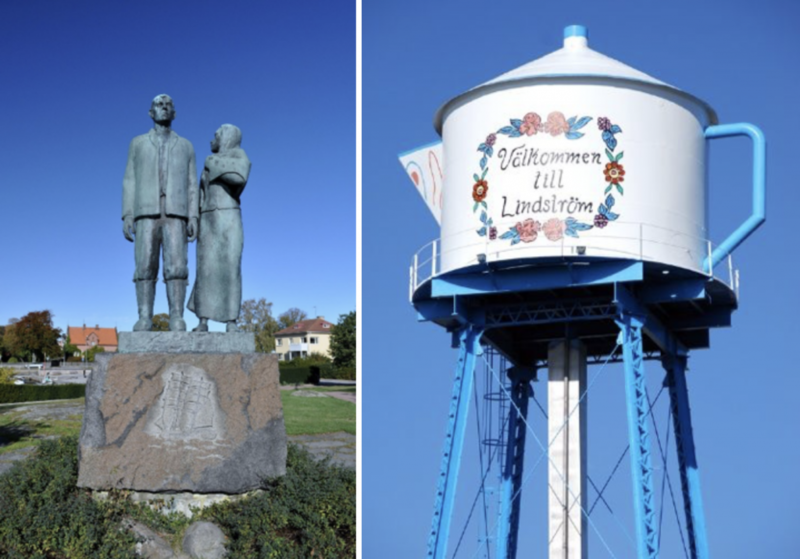 Lindström, sister city to Tingsryd in Småland, Sweden, is fiercely proud of its Swedish immigrant legacy, and celebrates that legacy in their annual festival, Karl-Oskar Dagarna. Center City was settled by Swedish immigrants as early as 1851, and their desire for a real church became a reality when the first 100 members established their church in 1854. The Chisago Lakes Swedish church and cemetery in Center City is rich in Swedish immigrant history. 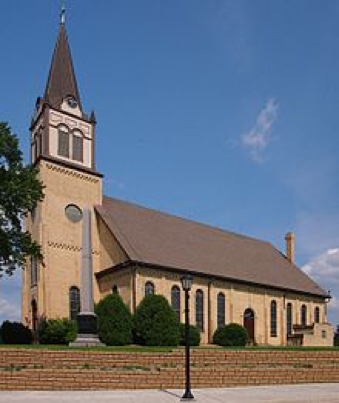 The church served not only as a place of worship but was one of the first structures in the Chisago Lakes area in the 1850´s to also serve as a school building and a city hall. A walk through the peaceful cemetery will reveal gravestones of Swedish immigrants that served in the America Civil War for emancipation from slavery. Other early gravestones proudly declare “Född i Sverige” (Born in Sweden) in Värmland, Småland and Dalarna provinces. 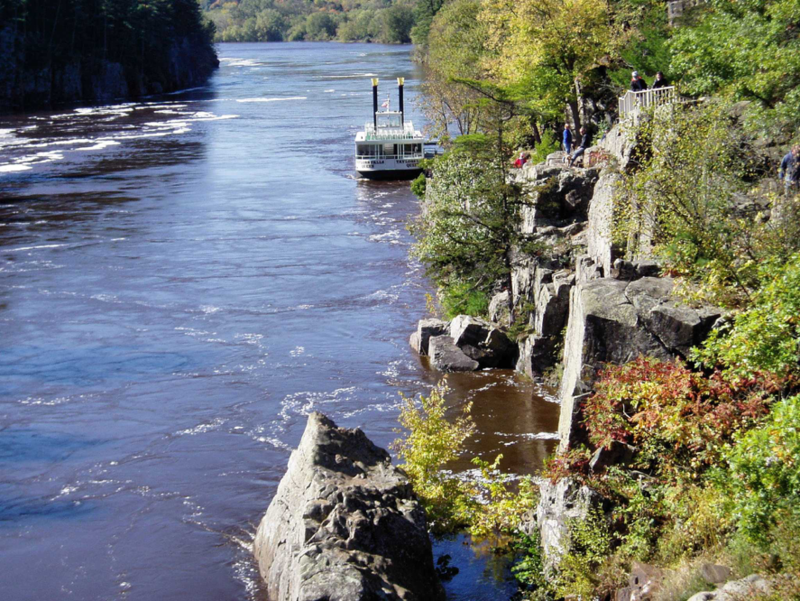 Taylors Falls, located on the scenic bluffs and dalles of the St Croix river by the Minnesota state border to Wisconsin, was first settled in 1850 and was the landing spot for many Swedish immigrants on the way to settle in the Chisago Lakes area. A post office and school were established in Folsom House, where the Swedish immigrants went to send and receive letters from loved ones back in Sweden. About two hours’ drive north of the Twin Cities, we find the international harbor city of Duluth. A port city in the middle of the great Midwestern center of the United States, Duluth was established on the tip of Lake Superior, the largest of the great lakes of North America. It is said that if the fresh water from Lake Superior was emptied, the water would cover all North and South America. Duluth was originally settled by the native Americans of the Dakota (Sioux) and Ojibwe (Chippewa) tribes. It was claimed for France in 1679, and became a part of the United States in connection with the Louisiana purchase in the early 1800´s. At that time the creation of the St Lawrence Seaway was a great undertaking to connect the Atlantic Ocean with the Great Lakes in North America. Duluth is 2,342 freshwater miles from the Atlantic Ocean via the Great Lakes/St. Lawrence Seaway. The iron mines of northern Minnesota provided iron and taconite to be shipped around the world in the late 1800´s. This led to Duluth being once home to more millionaires per capita than any city in the world at that time. Our overnight, 2-day visit to Duluth allows us to take a harbor cruise and visit the Great Lakes Aquarium, on the shores of Lake Superior. Duluth´s harbor welcomes over 1,000 ocean-going and Great Lakes freighters annually. We will see international ships in the harbor coming to load grain, iron ore and taconite and see the historic light houses of Duluth harbor. The Great Lakes aquarium is the largest museum that educates about the unique natural history, geography and wildlife contained in the world´s largest freshwater “oceans”. You can finish your day or evening in Duluth by strolling along the Lakewalk, a 7.5-mile paved path along the greatest of the Great Lakes. Start your walk in Canal Park in the shadow of the Aerial Lift Bridge, and enjoy ship watching, including thousand-foot freighters, entering or leaving the harbor. Day 6 & 7 - Mall of America "MOA "
At 5.6 million square feet, no trip to the Twin Cities of Minneapolis and Saint Paul is complete without a visit to the largest shopping mall in North America. 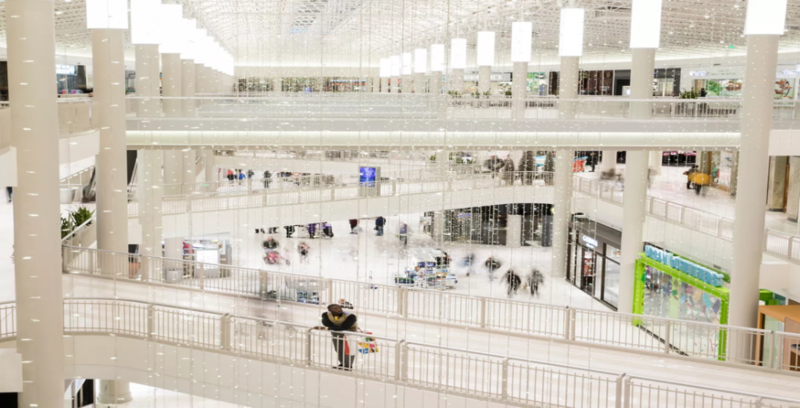 In fact, some visitors fly into the Twin Cities from Asia, South America and the Middle East just to shop at the mall. There’s something for everyone at MOA®, with over 520 stores to choose from. The final must-see destination in your tour to discover Minnesota requires at least a full day on its own. Not too fond of shopping? Mall of America contains a full amusement park. Nickelodeon Universe has 27 theme rides in total to discover. You can also see the Sea Life Minnesota Aquarium within the Mall of America, with a 300-foot-long ocean tunnel aquarium. It lets you stand below sharks, turtles, and stingrays. Find out why 5 million Americans love to live here, and why Swedish ancestors settled primarily here in the Great Emigration.